Widelands is a free open source (GPLed) real-time strategy game. It is built upon the SDL and other open source libraries and still under heavy development. 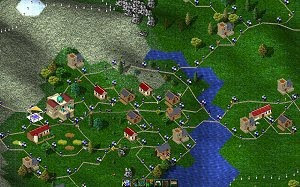 If you knew Settlers I & II (© Bluebyte), then you already have a rough idea what Widelands is all about. Yes, it is where the inspiration for Widelands came from. As stated before, Widelands is a work-in-progress game and, it seems, that it will ever be one. New features are added in each release.